A missing barrister, a severed thumb and fat chance of finding out the truth. Ella Fitzwilliam’s world is about to spiral out of control. She’s not cut out to be a private investigator. With little or no aptitude for the job, she’s been sent undercover to expose the hidden lives of two men who meet nearly every week at Buxham’s – a private members’ club where portions are large and secrets are held in strictest confidence. One of those men is Harry Drysdale, a defence barrister, and the other is Marcus Carver, an eminent surgeon with a tarnished past and much to lose. Ella knows he has unhealthy appetites, she’s sure he’s feeding his perverted habits and putting his female patients at risk but she has to prove it. When Harry Drysdale goes missing, Konrad Neale TV journalist tries to reveal the truth behind the lies, but some of the secrets start to reveal themselves… and they are big. I have a little confession to make. Yes I know, I have been ‘confessing’ rather a lot of late. Anyway back to this latest confession. Although I have a couple of A. B. Morgan’s books on my ever expanding ‘to be read’ mountain, I haven’t actually read one…….until now that is. I was invited to take part in the blog tour and I thought it would be an ideal opportunity for me to read and review one of her books. 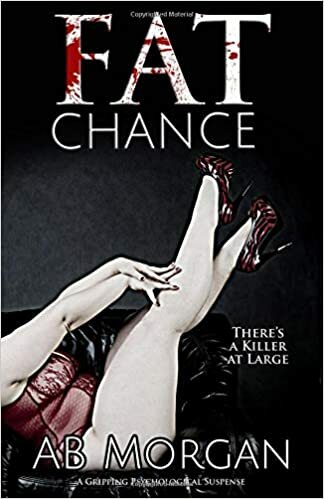 ‘Fat Chance’ appealed to me on so many levels and some of the lines in the book brought back not entirely pleasant memories for me but I will explain more about that in a bit. I have to say that I thoroughly enjoyed reading ‘Fat Chance’ but more about that in a bit. I really felt for the character of Ella Fitzwilliam and I took to her from the start. When we first meet her, she is the bingo caller but she deviates from the script as it were. I actually found myself laughing at the bingo patter that she was throwing out as I could imagine people spluttering out their drink of clattering their false teeth in response to what they were hearing. Ella is called into the manager’s office but although the manager is about to say that she is fired, Ella gets in there first and resigns. Ella is a ‘life model’ but she also falls into the job of Private Investigator, which is where she becomes involved with ‘Buxham’s’ which is a private members club catering for a particular clientele. I won’t go any further into specifics as I would hate to give too much more away. Ella is what you might call generously proportioned and she readily admits that she has an addiction to unhealthy foodstuffs. Ella is kind, she is generous, she is compassionate, she is hard working and she has a wicked sense of humour although I am not sure that she always realises that fact. At the beginning of my review I alluded to the fact that this book brought back some less than pleasant memories for me, so let me explain in a bit more detail. The storylines in this book do include talking about an instance of a survivor of bullying turning to comfort food as a coping mechanism and having a weight problem as a result. That’s exactly the same as happened to me. I was bullied throughout school for the colour of my hair among other things, so being a comfort eater I turned to food to help me cope, which just made my weight problem worse and made the bullying even worse. It’s like somebody once said ‘I eat because I am unhappy but I’m unhappy because I eat’. Anyway enough of my personal history because I don’t want to bore you to tears or to sleep. I found this book to be a book of two halves if you will pardon the pun. The first half was lighter hearted than the second half, which was much darker than the first half. The author’s writing style is such that you can’t fail to be drawn into the story from the first word and the author keeps your attention all the way through. That’s what happened to me anyway. I couldn’t stop reading because I needed to know what happened to Ella and whether or not she became a top private investigator, whether she solved the case and whether or not she survived to the end of the story. The more I read, the more I got ‘into’ the story, the more I wanted to read and the quicker the pages were turning. Reading this book certainly became addictive. I picked the book up, only intending to read a couple of chapters but I found that I was still sat there reading a dozen chapters later. I hadn’t realised just how quickly I was getting through the book until I looked up to check and found that I was nearly 40% through the book. I tried to ration how much I read from then on because I wanted to prolong my enjoyment of the book. My rationing attempt was unsuccessful and soon forgotten. For me ‘Fat Chance’ is brilliantly written. I particularly loved the way in which there’s a strong emphasis on the psychological aspect of crime and how that impacts on victims. I am particularly interested in psychology. The writing was made all the more authentic when I discovered that the author used to be a mental health nurse, which is a career I would’ve loved to have had but which is not an option for me unfortunately. In short, I really, honestly and truly enjoyed reading ‘Fat Chance’ and I would definitely recommend it to other readers. Judging by how much I enjoyed reading ‘Fat Chance’ I can 100 % guarantee that A. B. Morgan’s other books will not be on the ‘to be read’ mountain for very much longer. I will definitely be reading them as soon as I can. The score on the Ginger Book Geek board can only be 5* out of 5*.